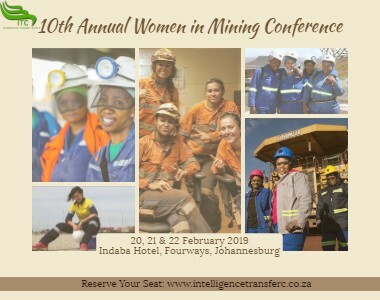 Intelligence Transfer Centre is celebrating our 10th Annual Women in Mining Conference which will be held on 20th-22nd February 2019 at Indaba Hotel, Fourways. Industry leaders will deliver key strategies on how we can further develop women in mining while making the industry more inclusive for the challenges they face. The first day of the conference will include presentations from Women in Mining South Africa (WIMSA), Samancor Ferrochrome, Komatsu Mining Corp. Group, Impala Platinum, and Anglo American to name a few. Day two will include presentations from Department of Labour, Anglo American plc – United Kingdom, Ivanplats, Gold Fields, Palabora Mining Company, as well as a presentation from Sibanye-Stillwater. We will also have workshops presented by Grizelda Grootboom as well as Timothy Maurice Webster. 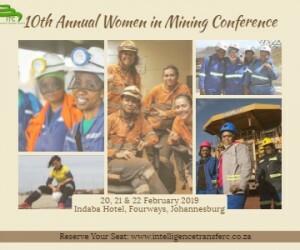 Attend this conference and gain latest strategies on how to continuously grow within the mining industry, safeguarding transformation while creating more opportunities for women in mining.